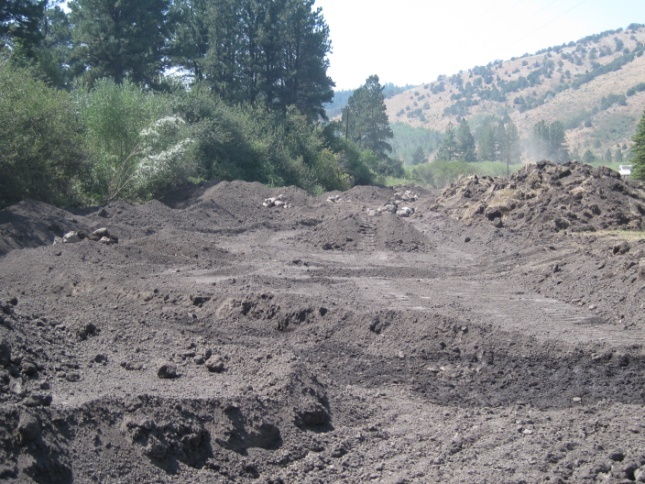 Since 2010 the City has been implementing annual trail/bridge/road improvements with grants from Idaho Parks and Recreation to control erosion and improve water quality in the area. The City works with BLM, USFS, ISU and many volunteers to monitor, evaluate, and implement the improvements. Prior to 2010 the City implemented a variety of erosion control projects. 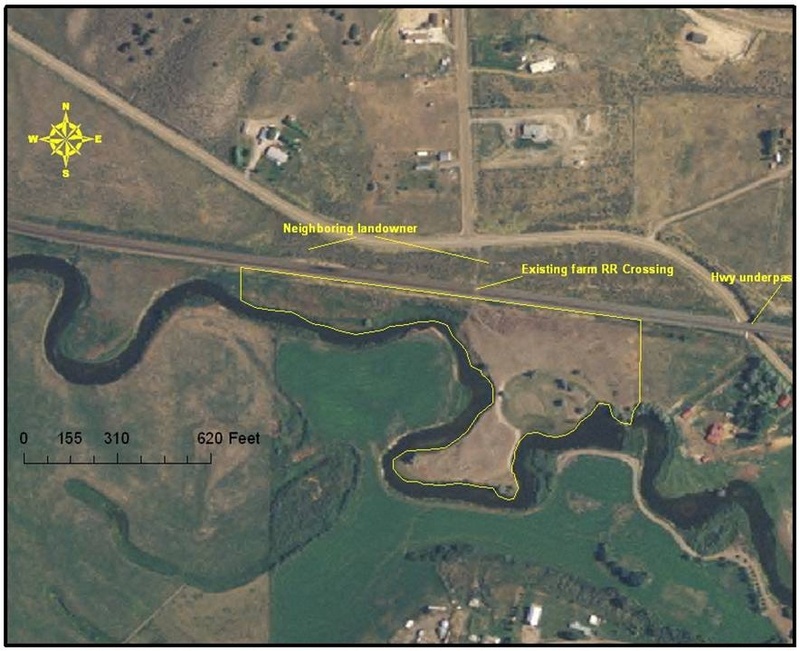 The City of Pocatello implemented this $1.2 million wetland project to capture stormwater runoff from the Day Street drainage within the City. The Day Street drainage contains about 10% of the City’s runoff. Construction occurred in 2009. Idaho Fish & Game, the Cariboo Conservancy and many volunteers have worked together to install fencing and water gaps on the Upper Portneuf above Lava. Work is ongoing. 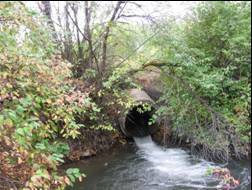 Idaho DEQ Funds awarded to protect spring water from cattle. 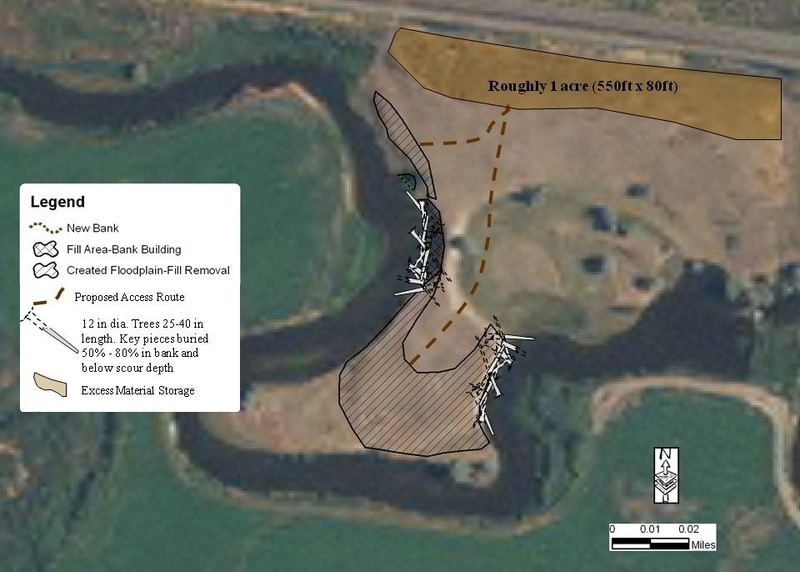 Description: This project extends along Mink Creek through the Guard Station and the Mink Creek Group Site. 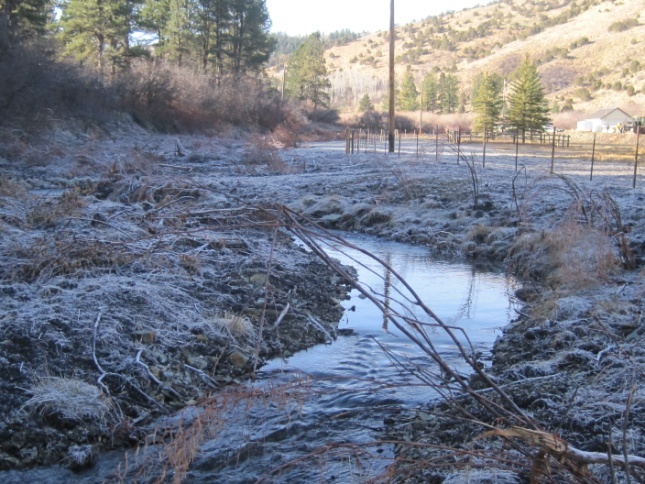 The Forest improved aquatic and riparian habitat by restoring approximately 1,000 feet of Mink Creek, modifying a nearby parking area, and stabilizing three streambanks at the Group Site. Stream Improvement: Mink Creek was historically straightened and relocated along the present horse pasture. The stream resembled a ditch with eroding streambanks while reference conditions up and downstream are a meandering channel that is less entrenched. 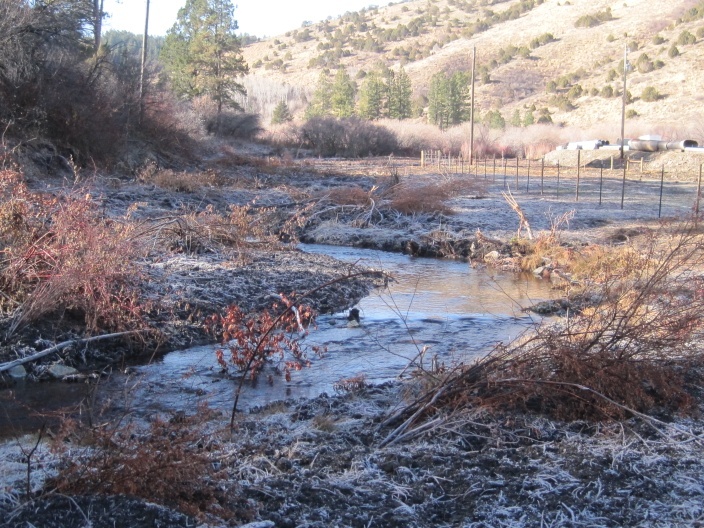 Approximately 1,000 feet of Mink Creek was reconstructed to improve habitat. 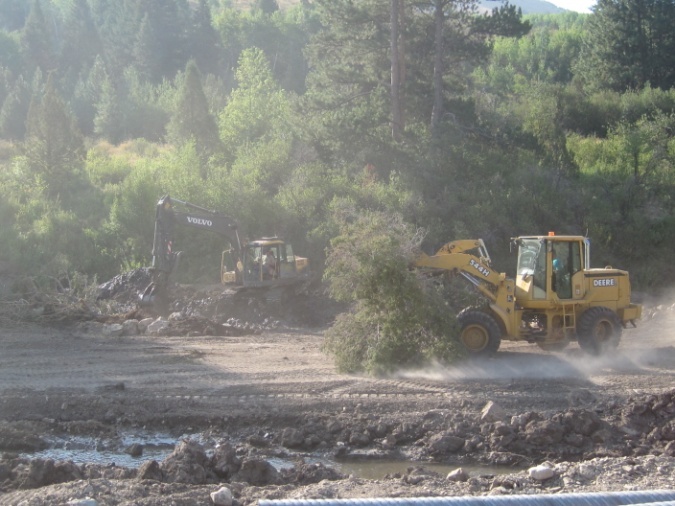 Heavy equipment was used to construct stream meanders, pool/riffle sequences, and a functioning floodplain. Heavy equipment was also used to shape the banks and armored them with trees, root wads, and willow transplants. 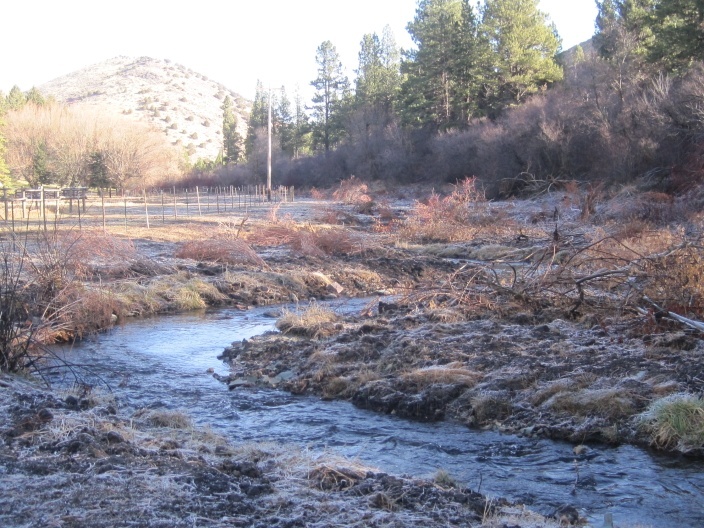 Riparian re-vegetation efforts included transplanting whole willow clumps and sedge-mats, willow staking, and seeding. Before photos: Straightened stream. The incised streambanks are unstable and lack riparian vegetation. 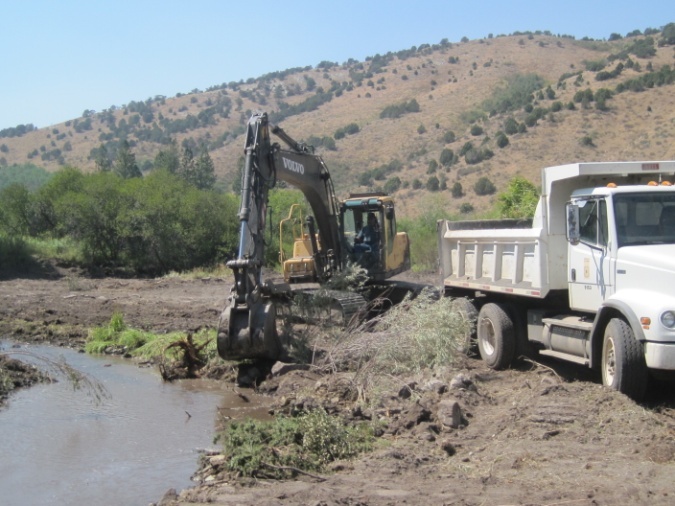 During: The Forest used heavy equipment to construct a new floodplain and stream channel. 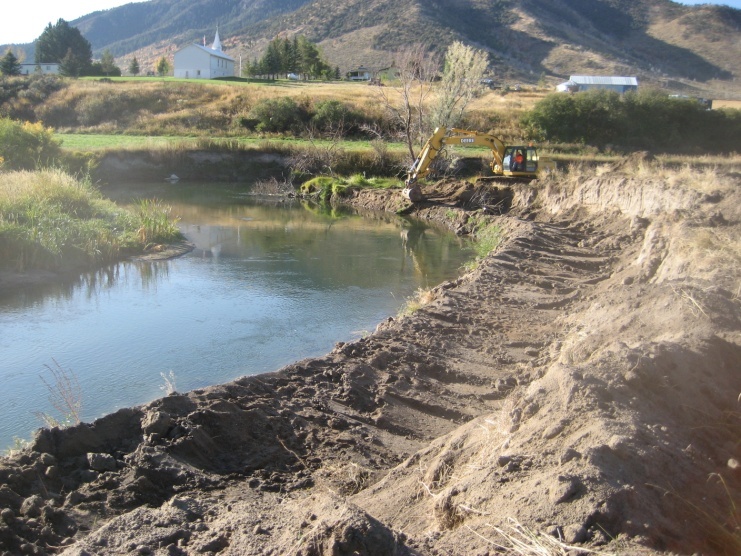 During: Constructing stream channel and placement of juniper trees and whole willow transplants. 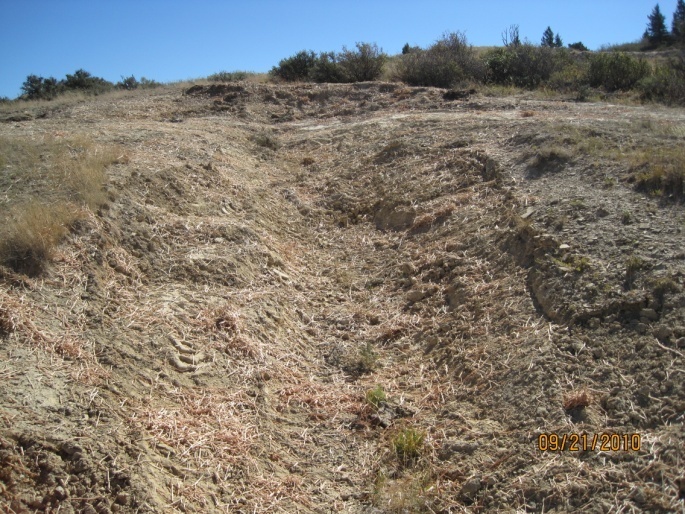 Before (left) and after (right) photos: Vertical unstable streambanks prior to project. 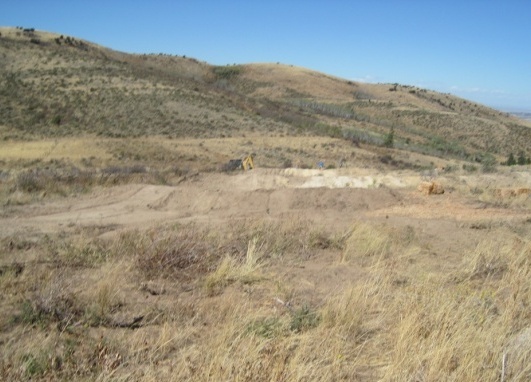 Partner(s) and Funding: The project was completed using approximately $24,000 in funds from the Eastern Idaho Resource Advisory Committee (RAC; Secure Rural Schools and Community Self-Determination Act of 2000 - Public Law 106-393: Title II Projects). The Forest’s South Zone Road Crew completed the project so a big thank you goes out to Blake, Rudy, Chris, Dave, and Joe. Thanks also to Corey Lyman for providing fisheries expertise. 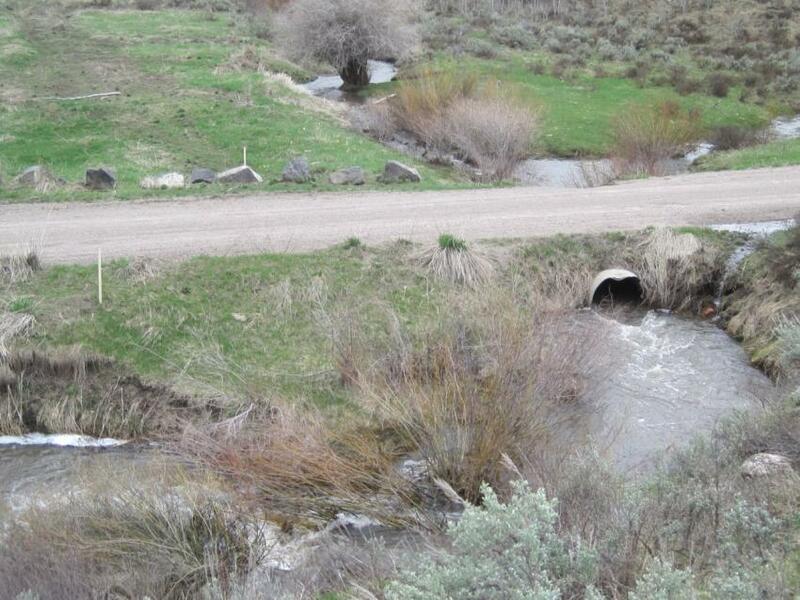 Future Work: The Forest has addition funding from the Eastern Idaho RAC to replace the undersized bridge on the access road to the guard station. That work will be completed in 2013. Description: The Forest continued making improvements in the South Mink Creek drainage. 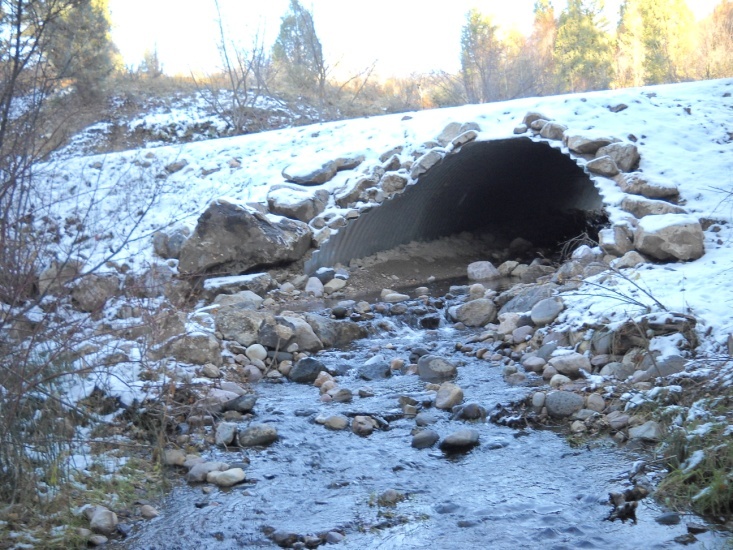 First, the undersized culverts at three road/stream crossings were replaced with 12-foot opening multi-plate bottomless arch culverts. That work greatly improved stream health and aquatic organism passage. Second, approximately 900-feet of road was relocated out of the floodplain near the lower culvert. 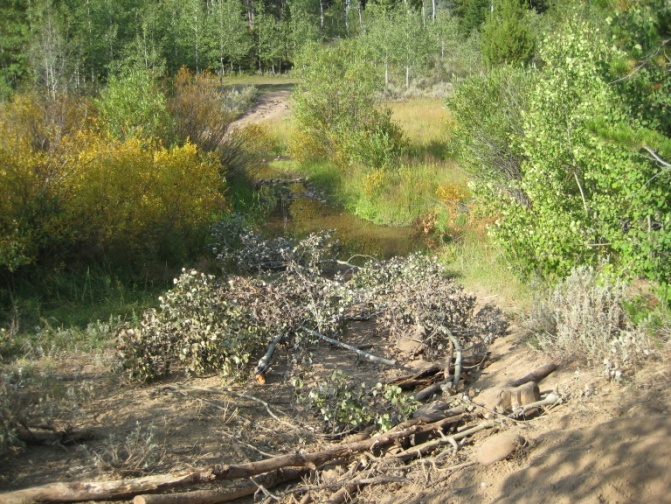 The old road prism was obliterated, two stream meanders were restored, and the area was planted with willows to increase riparian vegetation. 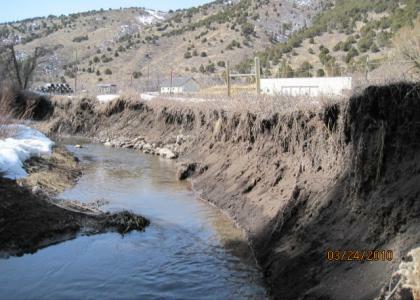 Streambank stabilization work also occurred near the upper culvert. Next, Forest Service Trail 142 was relocated to a more stable gradient and the old steep trail was obliterated. 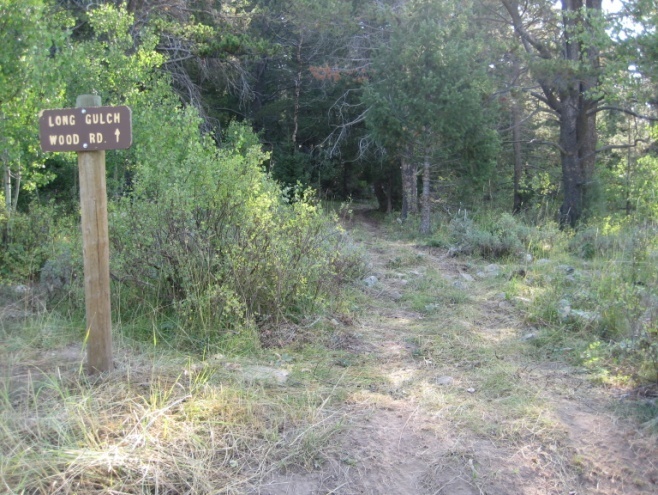 A new trailhead was constructed outside of the riparian area. In addition, road drainage improvements were made along the road. Before (left) & after (right) photos of lower culvert. A 4-foot diameter culvert was replaced with 12-foot span. Middle culvert: installing stream bypass prior to replacement (left) and completed photo (right). Before (left) & after (right) photos of upper culvert. The small culvert replaced with 12-foot span. Road relocation: prior to the project, the old road was in the valley bottom next to creek. The road was moved up the hill, meanders were restored, and the old road was obliterated and planted with willows. Partner(s) and funding: The Forest contracted this work out to a construction firm. The project was funded through the Forest Service Legacy Roads program and cost approximately $487,000. 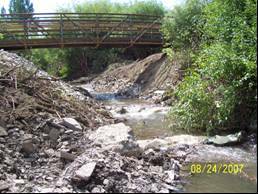 Description: The Forest replaced an undersized culvert on the Box Canyon Road (FSR 344) at the South Fork Mink Creek crossing. 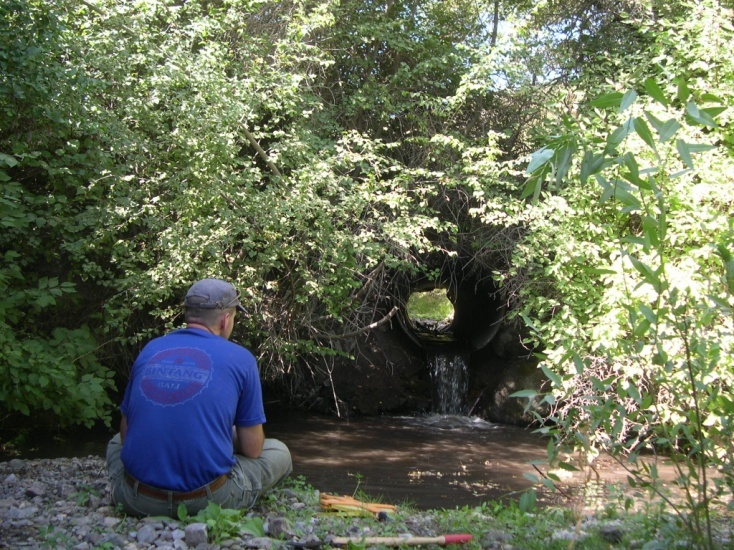 The old culvert (6 foot diameter) was undersized and often plugged by beaver activity, which provided road maintenance and environmental issues. 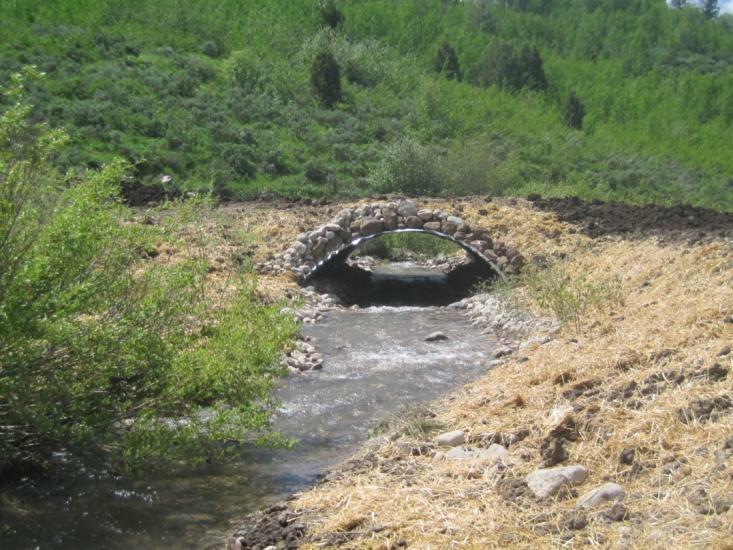 A large multi-plate bottomless arch culvert was installed in combination with a floodplain relief culvert. The new structure will allow for aquatic organism passage while better accommodating high flows. 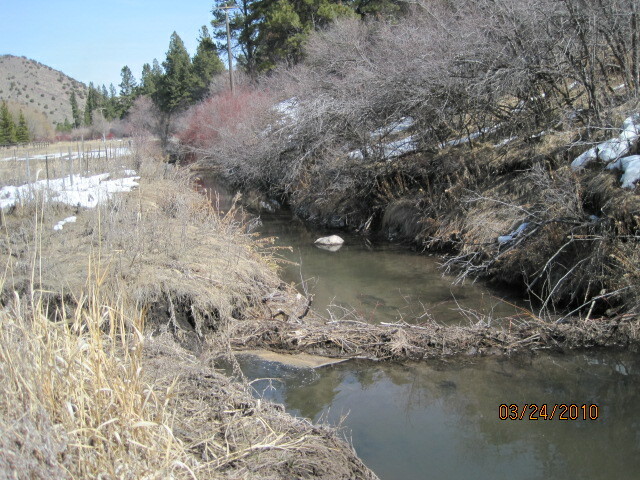 Pre-project photo looking upstream at the crossing plugged by beaver activity. 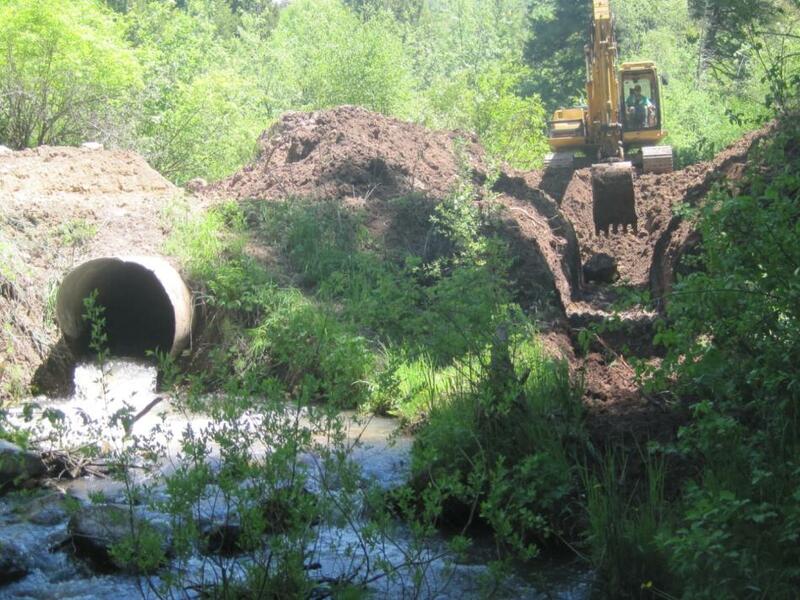 The beaver-plugged culvert is located near truck. a large pond developed, causing flow diversion and erosion and of the road. Pre-project photo of undersized culvert. 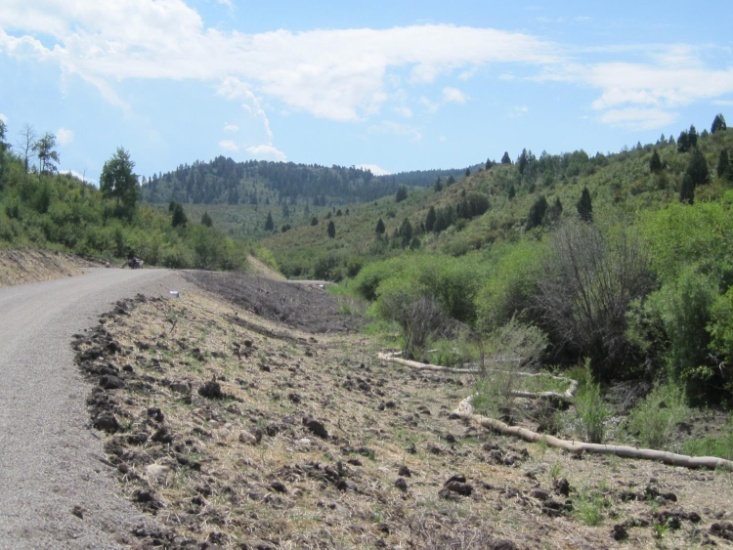 Partner(s): Bannock County – A big thanks goes out to the Bannock County Road and Bridge Department installing the project and the County Commissioners for making it happen. 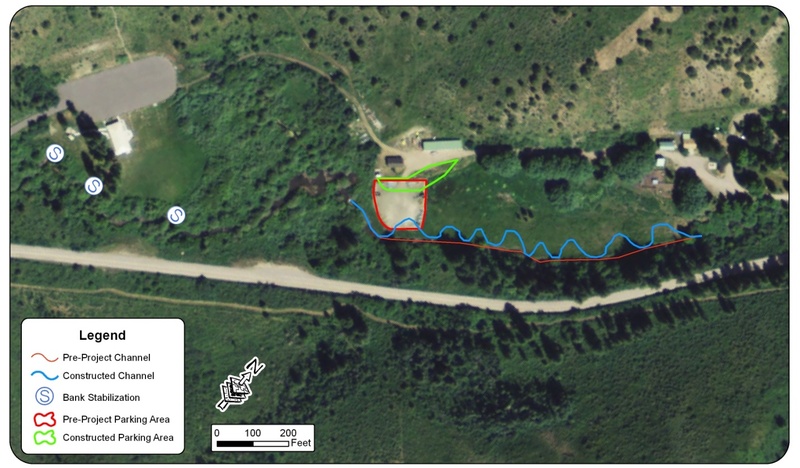 Description: The Portneuf River Project (PRP) partners secured ownership of approximately 8 acres of land known as Topaz Landing (Figure 1). Ownership was transferred to the Idaho Department of Fish & Game (IDFG) in 2010. 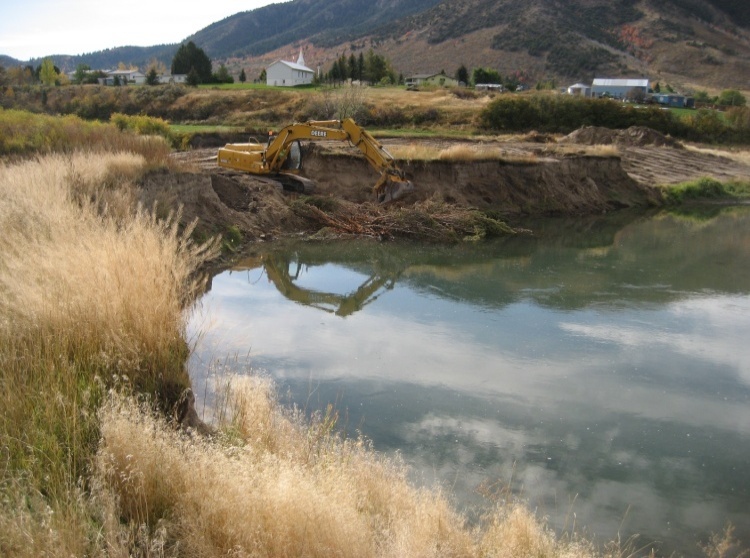 The PRP partners maintained an active role in completing the rehabilitation to provide public access, improve water quality, enhance floodplain storage, restore riparian habitat, and enhance the community and wildlife values of the Portneuf River. The property was degraded due to overgrazing by domestic livestock. 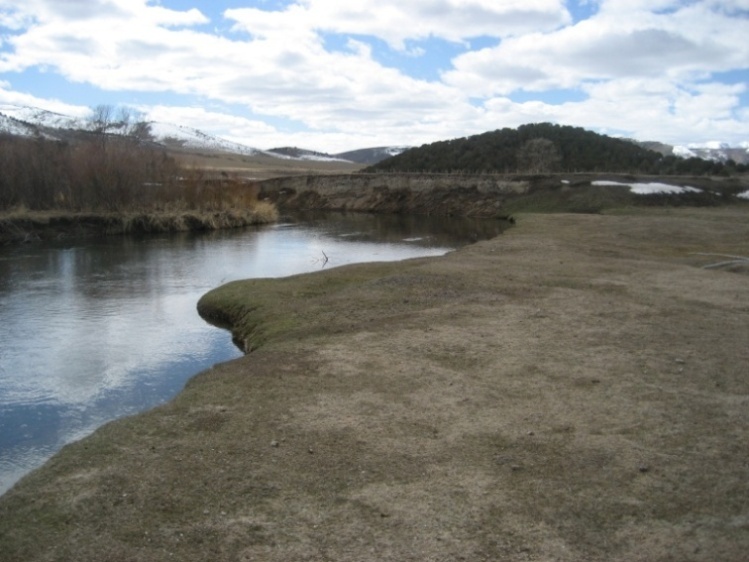 The lack of riparian vegetation led to degraded habitat and increased bank erosion and water temperatures. The river was deeply incised. 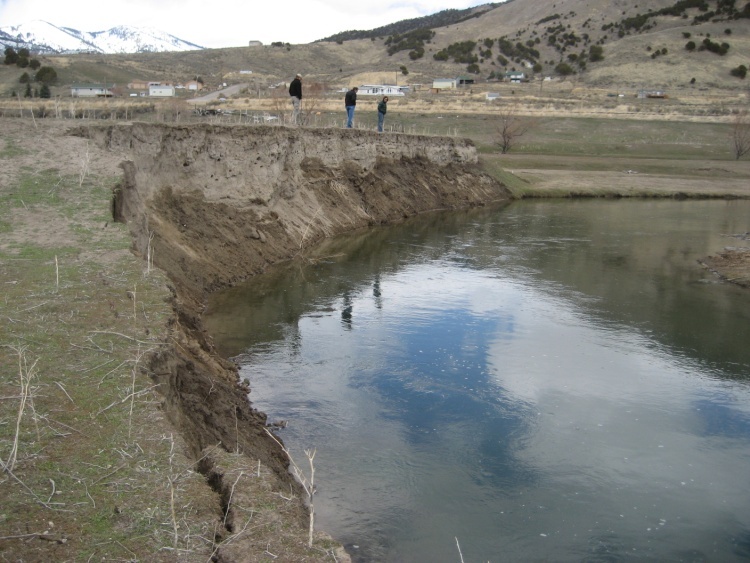 Most of the river bank on the property was nearly straight up and down sand embankments that were prone to erosion and falling into the river during high flows. Figure 1: IDFG property (topaz landing) is outlined in yellow. 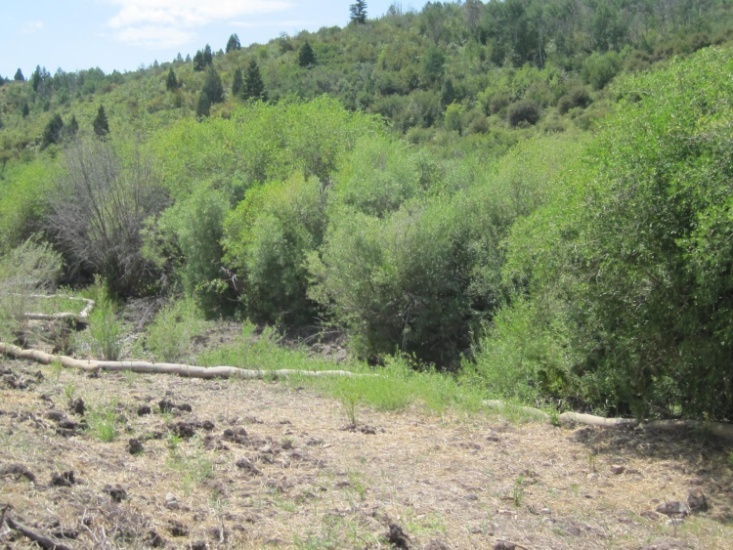 Note overgrazed condition and lack of healthy riparian vegetation prior to idfg ownership. River flows from right to left. Restoration design incorporating floodplain creation along nearly 540 feet of stream bank. BEFORE - Eroding bank (8-11 ft high) extending 200 ft along bank. 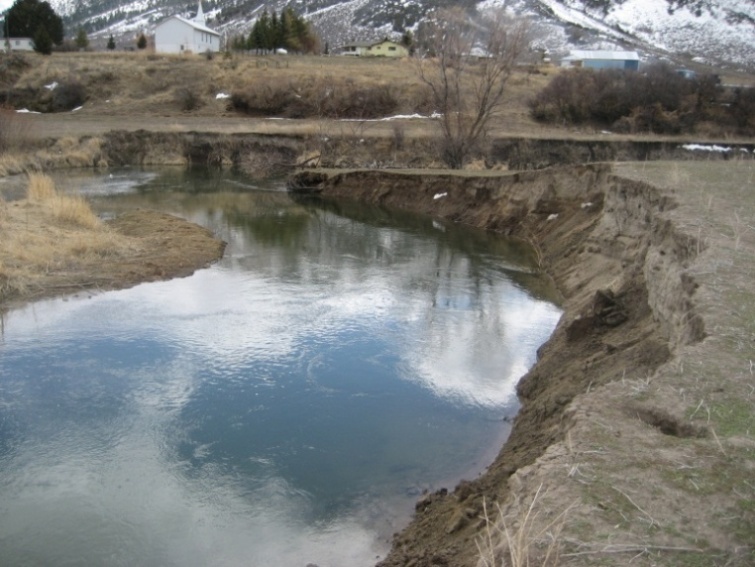 Between 2010 and 2011, an estimated 200 yards of material eroded into the Portneuf River here. BEFORE - Upstream end of property heavily over-grazed, lack healthy riparian veg. and contains extensive bank instability. BEFORE - High eroding bank (8-11ft high) section close-up from photo on left. Partner(s)/Funding: Overall restoration efforts were led and coordinated by Bud Small president of the Caribou Conservancy. 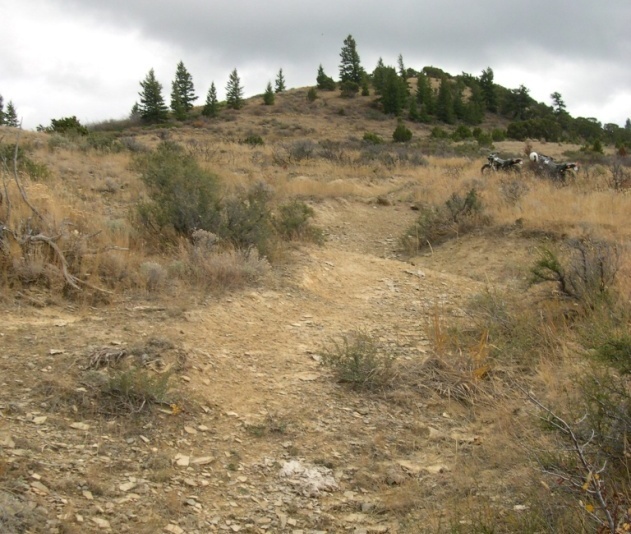 The project would not have been possible with the numerous contributors: Idaho Transportation Department, Idaho Department of Fish & Game, Simplot Co., Idaho Department of Environmental Quality, US Forest Service, US Fish & Wildlife Service, Cariboo Conservancy, Trout Unlimited, Sagebrush Steppe Regional Land Trust, and others. http://www.portneufriverproject.com/html/sponsors.html. Estimated cost of $50,000. 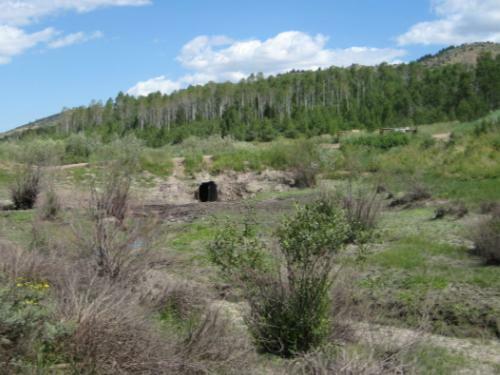 Project Description: These projects addressed road conditions, public safety, and stream/riparian concerns within the Pebble Creek drainage. 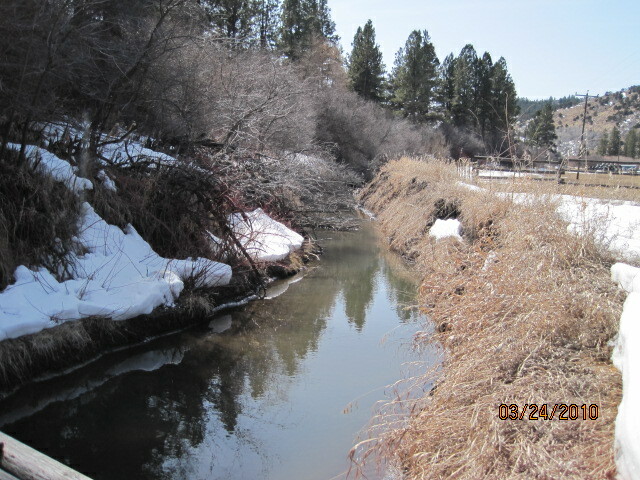 Long Gulch is tributary to the North Fork Pebble Creek. The project involved improving a road/stream crossing. 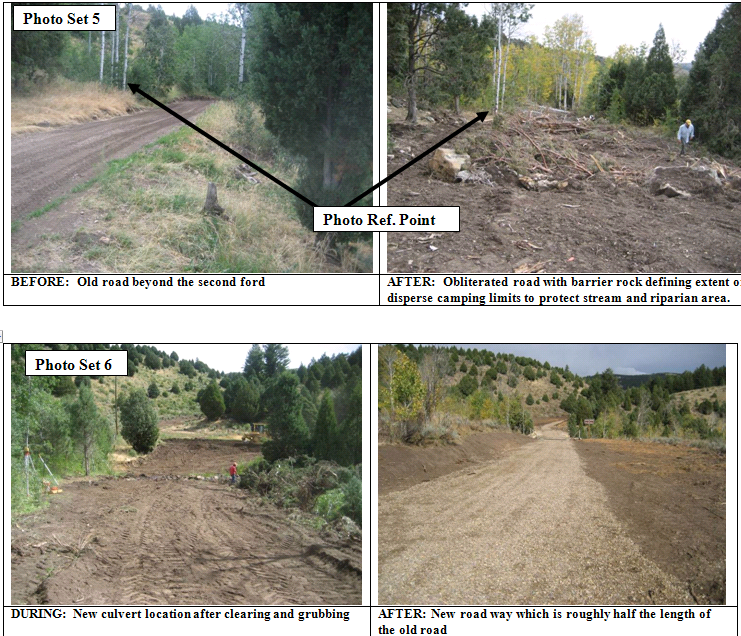 The road was re-routed to eliminate a second road/stream crossing and to remove a section of road in the riparian area. 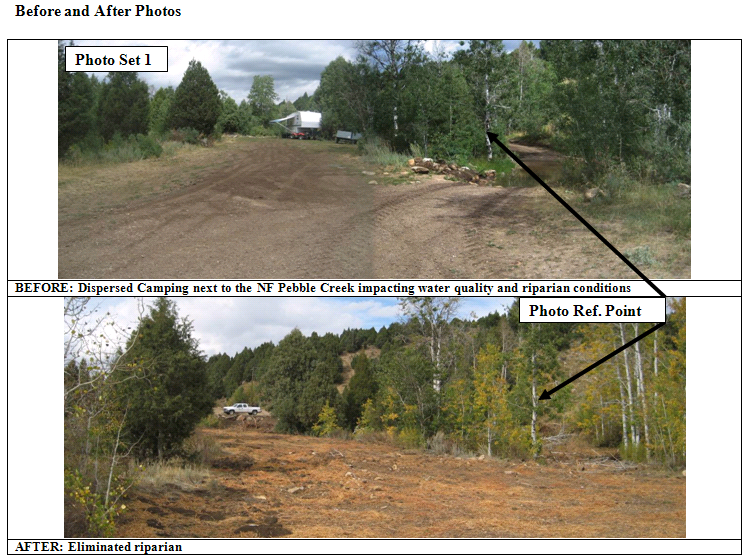 Dispersed camp sites were also relocated out of the riparian area. Lastly livestock watering gap was armored. 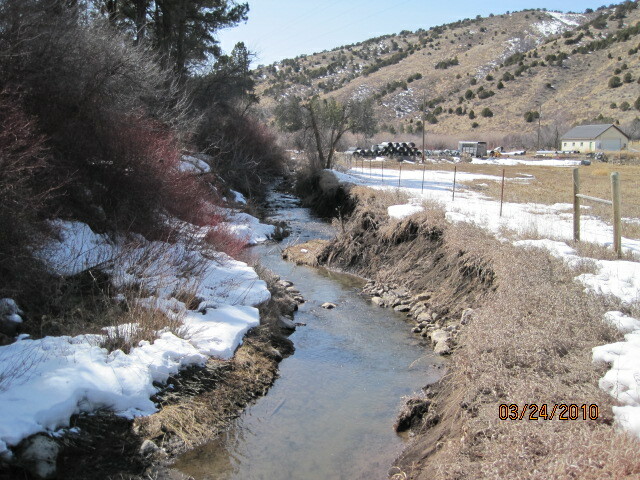 The South Fork Pebble Creek project included hardening of two existing stream ford crossings on FS Road 022: one on Pebble Creek and the other on the South Fork Pebble Creek. The Forest also improved road drainage on nearly 3 miles of FSR 022 that parallels SF Pebble Creek. Funding and Partners: The USFS Legacy Roads funding provided $55,000. Description: The purpose of this project is to control erosion on the ridge above the ski area. 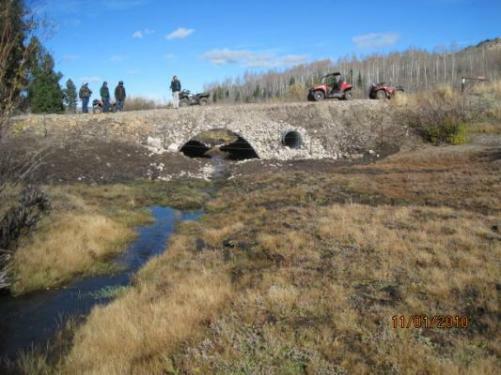 The project focused on obliterating an unauthorized, installing drainage on an existing ATV trail, and rehabilitating severe gullies upslope of the old ATV trail. Both the gully area and the trail obliteration area were seeded and protected with Woodstraw. 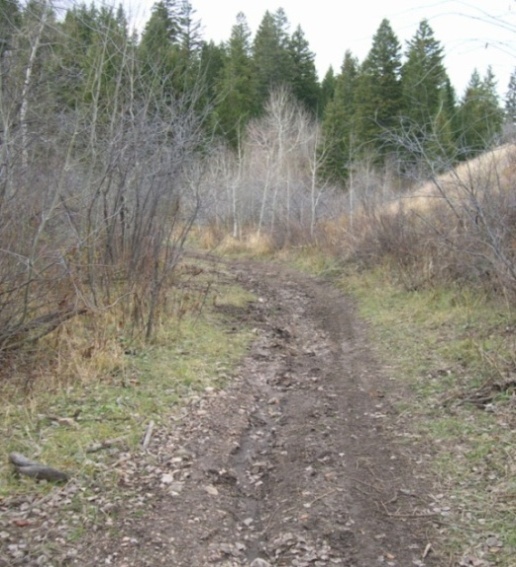 Unauthorized ATV Trail: A portion of the trail was obliterated and relocated on an existing road with more suitable slope and grade. 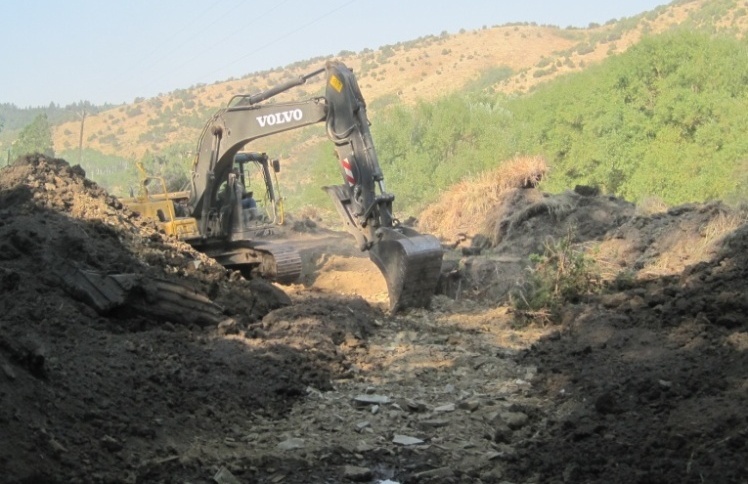 The backhoe ripped the compacted trail and spread nearby slash to obliterate the trial for a length of about 1,500 ft.
Gully Rehabilitation- Five or six terraces were constructed with a backhoe across the gully to control run-off and prevent water from accumulating. The area affected above the gully, including the eroded area, and the area below the erosion, is about 5 acres in size. Funding/Partners: The Forest acquired $6,000 in RAC funding for the Forest Road Crew to perform the work. The project was coordinated with the City of Pocatello which operates the Nordic Ski Area. City employees contributed an estimated $2,000 in in-kind labor to spread Woodstraw and seed along with USFS staff. The USFS contributed an estimated $3,000 in in-kind labor and supplied the Woodstraw and seed. During: Steep portion of the trail obliterated by the forest road crew. 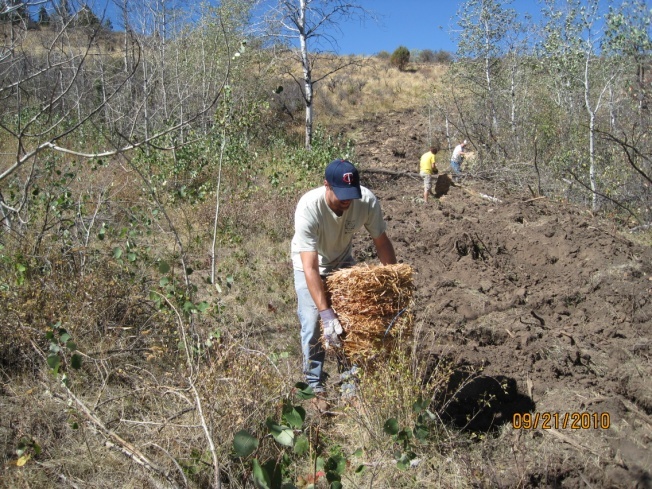 During: The city of pocatello workers spreading woodstraw to aid in site recovery and participate in the project. 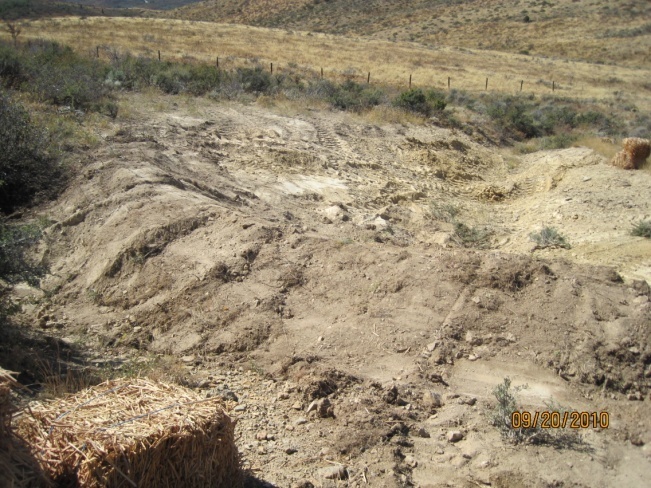 Before: Erosion on the atv trail leading to the ridge. 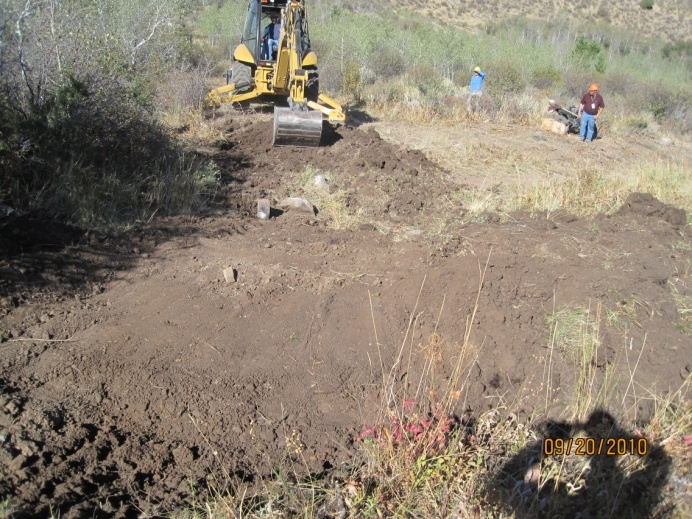 During: Approximately 10-15 waterbars constructed to improve trail drainage and reduce erosion. Before: Sever gully erosion reaching depths of 6 feet on ridge above nordic ski area covering about a ½ acre. After: Looking upslope at the constructed terraces that are designed to direct water away from the gullies and not allow water to concentrate and erode. During: Construction of a terrace by the fs road crew to eliminate concentrated flow from forming in the old gully. After: Seeding and woodstraw applied to gully areas with a view of a terrace at the upper of the photo. During: Looking downslope at the constructed terraces prior to seeding and woodstraw. After: Lower terrace completed and ready for seeding and Woodstraw. 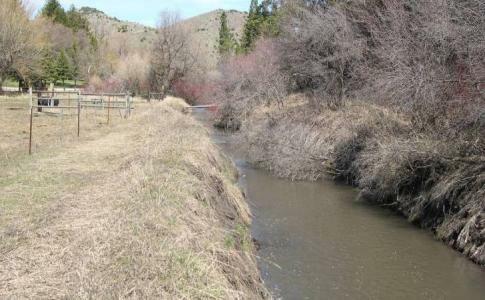 Description: To reduce erosion and improve water quality and riparian conditions, roughly 500 feet of trail was re-routed to eliminate an eroding and denuded stream crossing. Rehabilitation of old trail and stream crossing. Additional rehab on the opposite bank had not yet occurred when the photo was taken. Description: The Youth Conservation Crew installed a walk through gate at a newly renovated trail in the Pocatello Municipal Watershed. This was a problem area with wire gate being left open in the past. The seasonal range crew also reconstructed a ½ mile of fence in the same area. 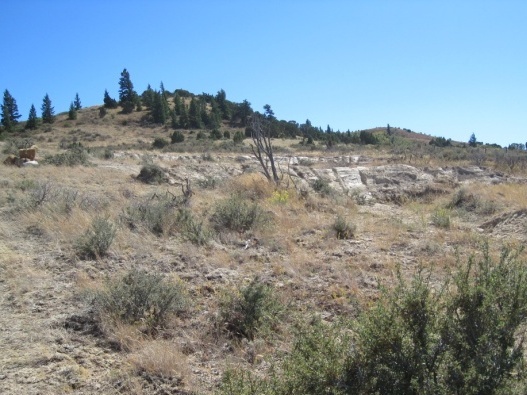 Partners & Funding: The Forest partnered with the City of Pocatello. 2012 Description: The Forest closed 1.5 miles of trail in Bird Canyon and 1 mile of trial in Mink Creek Pine Plantation to improve soil and water resources. The project was funded by the Idaho Department of Parks and Recreation (IDPR) and Eastern Idaho Resource Advisory Committee. 2008 Description: The Forest closed several unauthorized trails through barrier rock placement and/or signs. Rehabilitation was done by scarifying the ground surface and seeding. This occurred near Inman, Elk Meadows, Crystal, and South Mink Creeks. 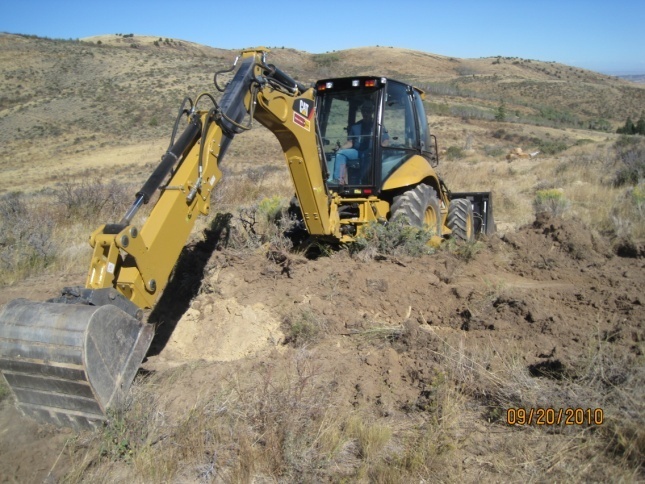 Partners: Sierra Club ($3,000), Idaho Fish & Game, and the Forest Service recreation, watershed, road crew staff worked together to improve watershed conditions. 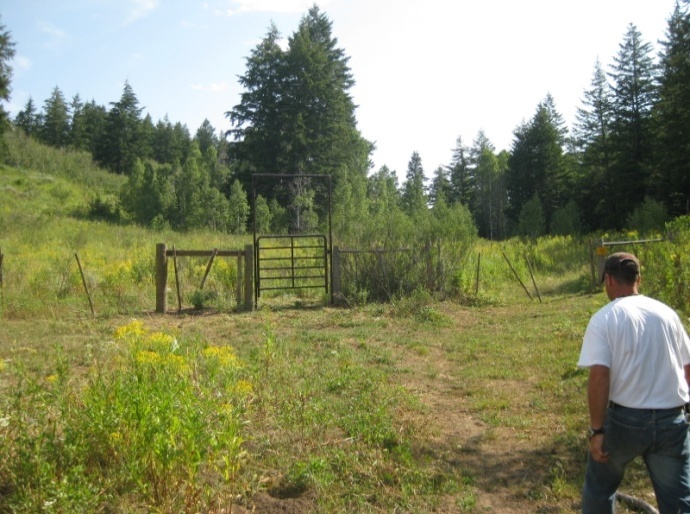 Description: The Youth Conservation Crew (YCC) rebuilt an old exclosure fence in Pebble Creek. 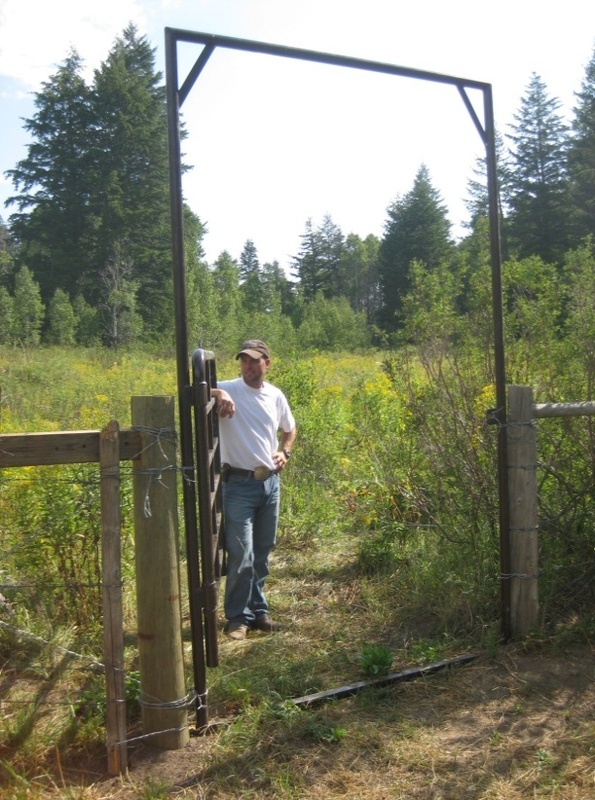 The fence excludes livestock grazing to protect stream function and water quality. Description: The purpose of this project was to improve watershed/stream health and aquatic organism passage conditions within Mink Creek. 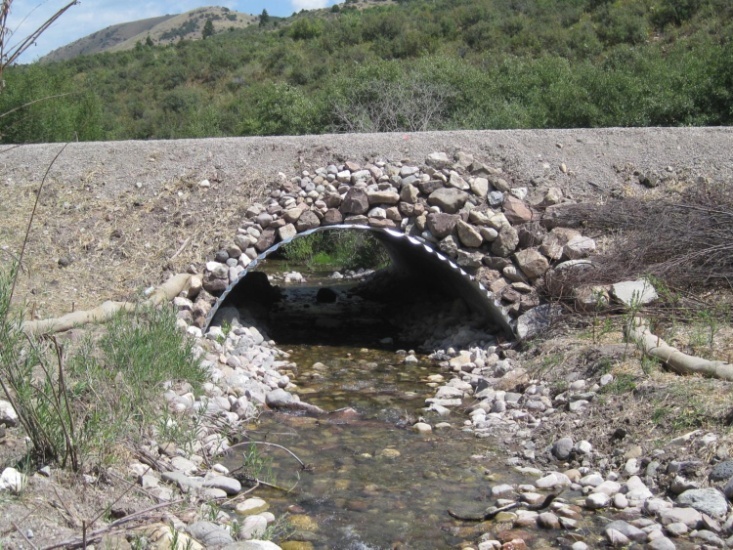 A 4-ft diameter culvert on the trailhead access road was replaced with a 35-ft span trail bridge. The trailhead was relocated to the opposite side of Mink Creek so that a full sized vehicle crossing was longer necessary. 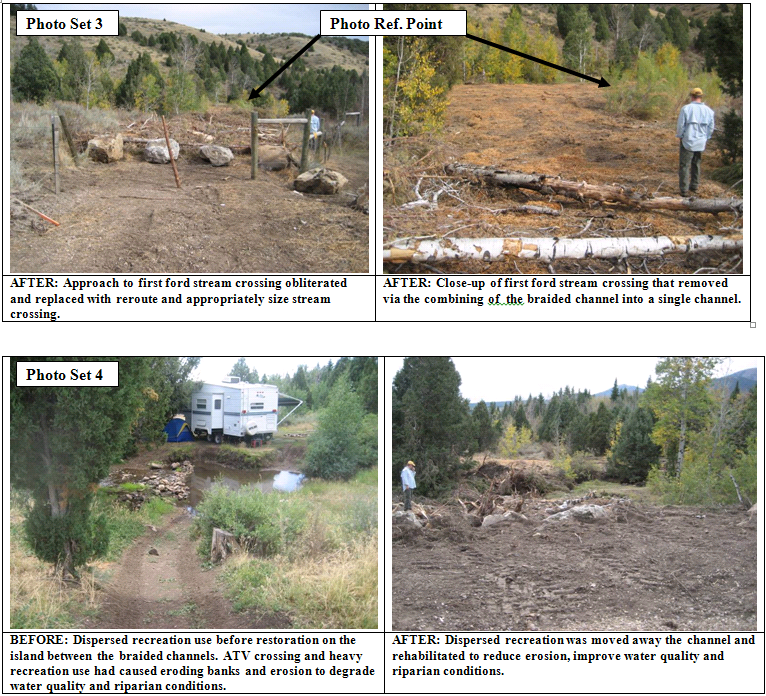 Local conditions were improved by relocating the trailhead farther from the stream, improving storm water drainage at the trailhead, improving flood, debris, and aquatic organism passage, and improving the safety of the transportation system. 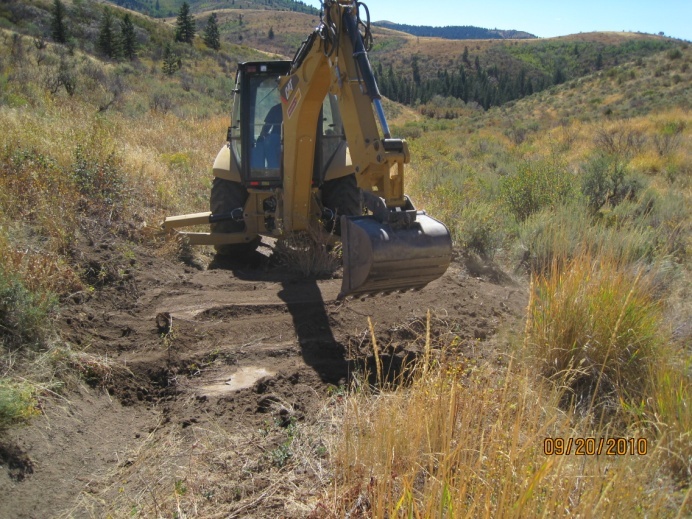 Partner(s): The work was completed by the Caribou-Targhee Road Crew. 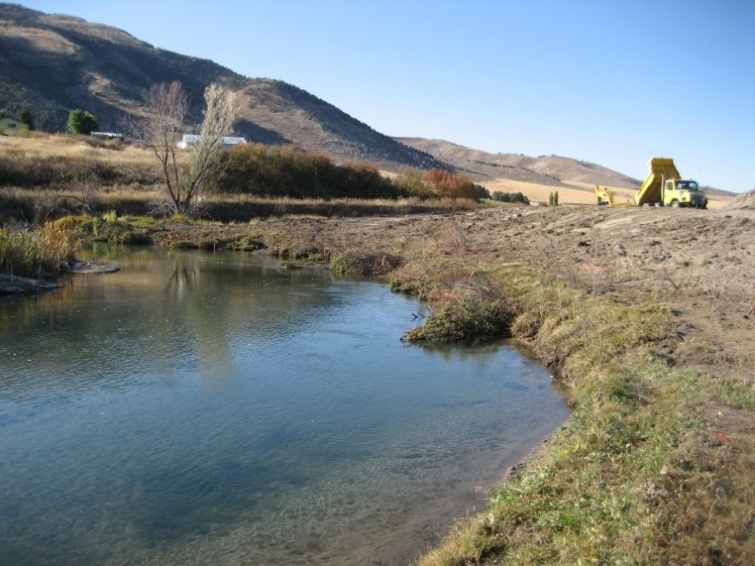 The Southeast Idaho Flay Fishers (Pocatello Trout Unlimited Chapter) planted willows in November of 2007. Funding: The project totaled approximately $40,000. The Forest provided $10,000 in Challenge Cost Share funds. An additional $35,000 was provided by the Federal Highways Aquatic Passage Fund (HTAP). 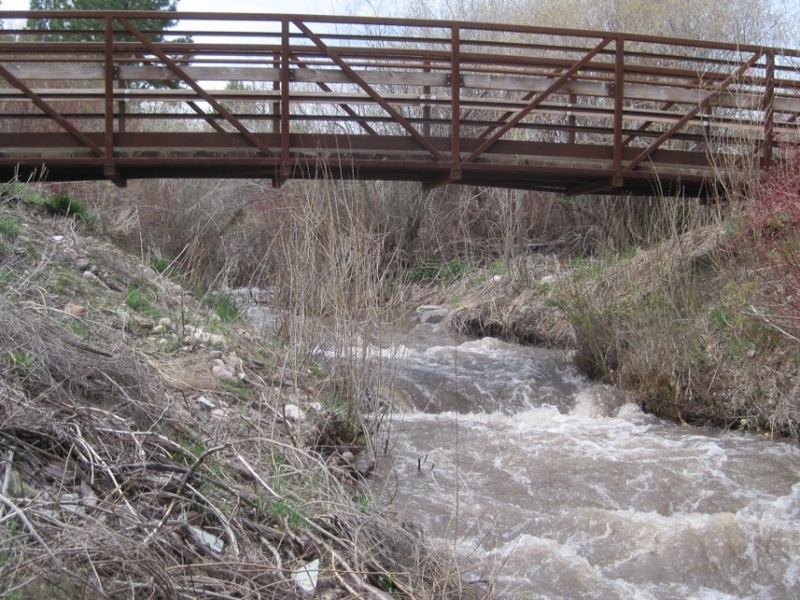 This 2012-2013 project was a joint effort by many PWP partners to save the USGS stream gage on the Portneuf River by the Topaz bridge. The river was eroding away and was close to eroding the gage station. Through a collaborative effort material was added to stabilize the river banks and preserve this important monitoring feature.